Is it just me, or did Mother’s Day sneak up on us as quickly as Easter this year? 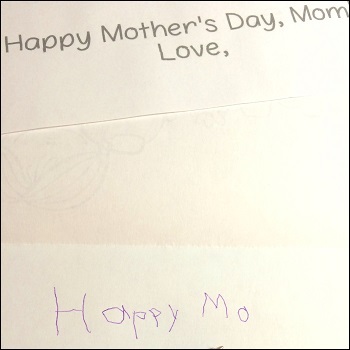 The time-saving factors in this Mother’s Day Card is twofold: 1) Print or photocopy and your students instantly have something to color, and 2) the inserts that allow each child to print (or paste if unable to print) at the level they are comfortable with. 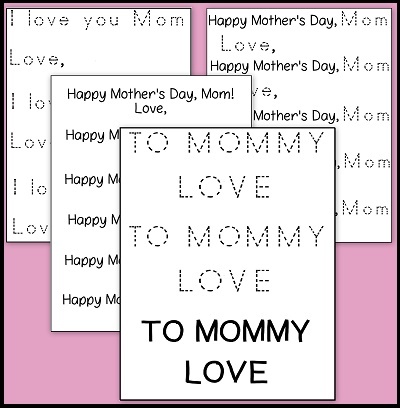 By pre-printing the various options, your students have different choices for how they can complete their Mother’s Day message, and most will be able to do something independently. Disclaimer: Student names do need to be added to individual cards! Some students might be capable of printing a message on their own. Others may copy from a strip or trace. Those who are not printing yet can simply glue their message in. Perhaps you’re working on 1:1 correspondence and would like to take this opportunity to practice. Cut the words apart and have your students reassemble the sentence in order, with or without a model. Over the years I realized that I had to adjust my expectations to my circumstances. Some years we may have a smaller number of students in our class, students that work more independently or more support for our students with special needs. Particularly at this time of the year, and even more with Father’s Day, schedules go awry and every week feels more frantic than the week before. Was the goal of the activity to teach and assess a particular goal or skill for any or all of my students, or for my students to simply enjoy creating something special for mom? If you like to #DifferentiateByPrinting as is done with this card, check out these growing collections: Sight-Word-Stages Leveled Reader Sets and Read and Write and More! Did you see what I added to the title? I am a mom and a teacher and a MAJOR appreciator of teachers myself. Thank you to all of you for getting in there with your students everyday. TpT has announced that it’s time to appreciate teachers with a big, site-wide sale! Please see the button below for details! Enjoy the sale, and Happy Spring!